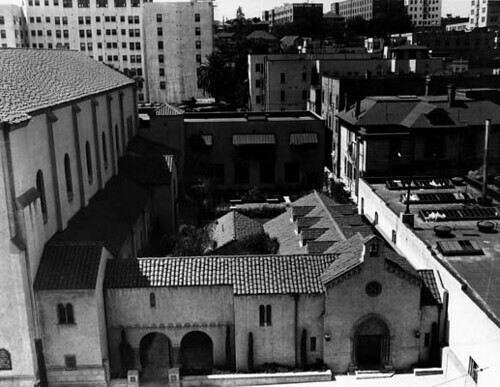 Well, sad to say, but this landmarked Episcopal church building was torn down in March, 1980, to make way for the fifty-story office building that occupies the site today. Hey! It’s the Rex Arms (1912) back there on Wilshire Boulevard, formerly Orange Street. It, as well, is long gone. Sorry about all the direct quoting, but my question is: Where’s all of this today? I reckon all those stone fragments from the famous European cathedrals and earliest American churches are God-knows-where, but the stained-glass windows were preserved. Turns out the courtyard was something of note. You can make out some of it in the picture below. A lotta tile for that roof. St Paul’s had dodged the wrecker’s ball off and on for about two decades when, in 1979, Bishop Robert Rusack and the Episcopal Diocese of L.A. sold it to Mitsui Fudosan (U.S.A.), a real estate company based in Japan, for about $4 million in cash. Rusack went straight to Santa Anita, and lost it all on an exacta in the seventh (kidding, probably). In my St Paul’s Googlefest, up popped this bit about Frank Owen. He was the church's Organist-Choirmaster for more than twenty years, beginning in 1953. The photo at the top is from L.A.'s City Planning website. The rest of the black and white photos are from the Los Angeles Public Library archives. And, now, the former home of St Paul's Cathedral. Thanks very much for these, Floyd! I was referred here pretty early on and have been avidly following each new post. I remember my mother taking me to see the interior of St. Paul's in the late 1960s, and the later news of its demolition. BTW, Have you seen the big historic landmark photos lining the halls to the L.A. City Councilmembers' offices in City Hall? No, I haven't seen those City Hall photos, but I'll go check them out. Thanks a million for stopping by, Darrell, and leaving the comment. You're lucky to have spent time in St Paul's. As a Frenchman who lived in L.A. for 2 years and who's just come back from a 2-week stay there, I love reading your blog from Paris. Thank you very much for what you are doing for preserving and remembering the history and buildings of L.A. Thanks very much, Alexandre. That's great to hear. Thanks for the photos! My parents visited LA way back in 1944 and this was one of their stops. They attended a Christmas Eve service here. You're welcome, Liv. Thanks for the comment. Where else did your parents visit in 1944 L.A.? Hi there, great to see these old pictures of St Paul's. I'm here because I was looking for an exact location. A rock band called The Electric Prunes performed there, playing "Mass in F Minor" way back in september 1968. I'm also trying to find information on old recording studios and record companies, mostly L.A. based. Maybe you know best on how to approach this? Thing is, I'm from Europe so I could use a bit of help. Hi, Kristof. I would've loved to have seen the Electric Prunes play there in '68. Kim Cooper, who leads an L.A. rock and roll Esotouric tour, recommends you try the book The L.A. Musical History Tour: A Guide to the Rock and Roll Landmarks of Los Angeles by Art Fein for starters. WOOOOOWWWW, it looks like the perfect book for me. Thank you and your contact for the tip. I'm buying a copy, right now. Thanks! Btw, the concert was a stinker - at least that's what the press tells us. But, like yourself, I would have loved to have been there nonetheless. Thank you for the truly memorable trip down memory lane. I used to (try to) sing in the Boy's, then the Men's Choir under the direction of Frank Owen at St. Paul's from 1956-1962. I can remember fondly experiencing the presence of a jam-packed celebration of the Midnight Service on Christmas Eve, when 1200+ parishioners from around the county would find their way into Downtown to attend. I am saddened that the Rose Window at the very front of the church, which I marveled at each Sunday from my place in the choir stalls, and which was surrounded by the Antiphonal Organ Pipes in the gallery, appears not to have survived the destruction of the Church. Too bad. 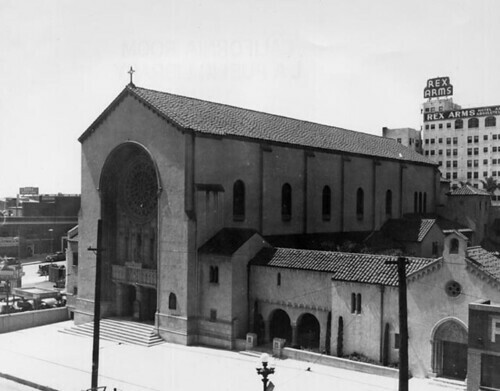 St. Paul's would have been a most stately tribute to Old Los Angeles had it survived. Thanks for checking in, Don. I never had the opportunity to see that window. For what it's worth, St Paul's seems to be one of the city's landmarks most missed. I remember that the Cathedral Choir made a record during my tenure ('56-'62). On the jacket cover was a full page B&W photo of the Rose Window and pipe stacks in the Gallery (if I remember correctly - it's been a few years). I shall go through my vinyls in storage to see if I can find the jacket and send you a scan. That'd be great to see, Don. I hope you dig it up, it only to remind me what vinyls were. 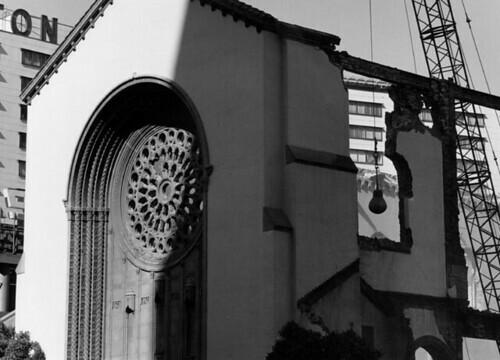 Seeing the pictures of the church going under the wrecking ball and what has replaced it is tragic. 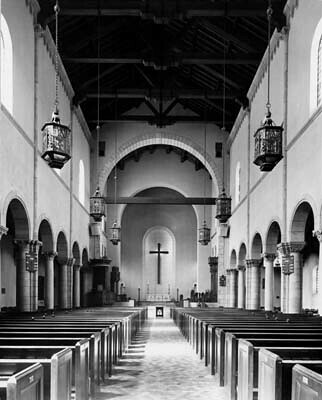 Thank you for these photos of a place where we spent so much time; always journeying from our home in Azusa to hear "Messiah" when I was a kid, and later, where I attended daily Mass in the chapel on my lunch hour. Dean Ev Simson was a friend, as was Bishop Rusack. When they tore it down, we acquired doors, windows and a piece of the facade fabric for our monastery on Whidbey Island WA. Thank you for the comment, Br David. Do you mean the Tahoma One Drop Zen Monastery? Whidbey Island must be gorgeous. It sure is a world away from Azusa. What a marvelous find! I was associated with St. Paul's Cathedral from 1962-1970 having served as Assistant Organist to Frank K. Owen from 1965-1970 prior to going onto my own career as a Cathedral Organist-Choirmaster. My father, a real estate appraiser and counselor in Los Angeles (MAI, CRE)was a consultant to Bishop Bloy during discussions about the possible sale of the land and building. It was his urging that the air rights should be sold and not the land nor building, but, alas, history tells of a different outcome. Many thanks for posting these pictures and comments! Hi, William. I had seen your name in conjunction with Frank K. Owen's and preserving some of his work. Thanks for that, and thanks for the comment. I wish the church would have followed your father's advice, for sure. What a marvelous find indeed. Dr. Crosbie e-mailed me about your site and, as another ex choir member of many years under Frank Owen, I am thrilled to see the history and photos of the Cathedral preserved, and excited to read others’ comments. How sad that neither the City nor the diocese cared in return. i now work at the building where St. Pauls used to be, we have a huge fire/water fountain up front that i was told has to do with the former cathedral, does anyone know anything about it? 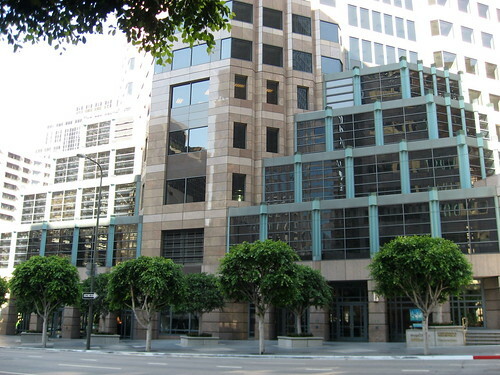 the building is on 601 s. figueroa. This brings back fond memories for me. I attended a Palm Sunday service here back in 1970. When the 1971 Sylmar quake happened, the structure was deemed unsafe. It would have cost a great deal of money for them to fix it. So, they took some of the money and built a new (1980s) Diocesan "Cathedral Center" and created a mundane look as what could only be described as "Our Lady of the Taco Bell Drive-Thru" in Echo Park down the block from Sister Amy's place. St. Mark's Epsicopal Church in Glendale is fortunate to have a memento from St. Paul's: a damask lectern hanging which features two appliqued angels on it, which was salvaged from the rubble by a former organist at St. Mark's. It now hangs, encased in acrylic, on the north wall near a votive candle stand and is a wonderful reminder to those of us who once knew and miss the beauty of old St. Paul's downtown. Your site is WONDERFUL. Your efforts keeping it up are very much appreciated by this native Angeleno. -- Robert. Thanks for the information and kudo, Robert. 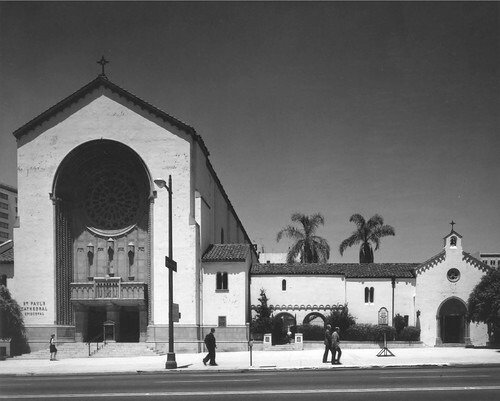 The organ was saved and reinstalled in 1995 at Saint James' Church on Wilshire. I noted in your web tribute to composer and organist Frank K. Owen that, to the best of your knowledge, he had no children. His son, Frank Owen Jr., in 1950 was one of my mother's students at Western Michigan College (now University). I believe Frank Jr. had also served in the Navy, but I have not heard about him since that time. My best guess is that by now Frank Jr. would be in his 80s. According to one of his organ students and fellow my choirboy, Gary Forsleff, his wife Elsie was in poor health in the early 1970s and sadly took her own life. I remember Frank Owen well, as when I was a choirboy at Kalamazoo St. Luke's Episcopal Church, he took me under special tutelage as a soloist. He was also one helluva organist and harpsichordist. A real gent. Hope this information is helpful, and thanks for your fine words. I was in St. Paul's boys choir from 1950 to 1955, first under Donald Coats, then Frank Owen. After my voice changed, I was an acolyte for about 5 years until I went into the Navy. Frank did have one son who unfortunately died in 1954 or 1955 from something to do with the brain. I am pleased so many people remember the Cathedral and Frank K. Owen. Some accurate facts: Elsie Owen (Frank's wife) died in July, 1966 after a fairly long battle with Huntington's Corea. Her funeral took place in the Cathedral; I was the organist for that Service. Frank Arthur Owen (Frank's son) died while attending the Christmas Eve Service at the Cathedral with his mother and wife (Carole) in 1965. His funeral also took place in the Cathedral shortly after Christmas. Frank's funeral took place in St. Margaret's Church, Palm Desert; he was buried with his son and wife in Los Angeles. Thanks a ton for checking in, Bill. People clearly have fond memories of St Paul's. The information on the Owens family members is much appreciated. I attended Bishop Rusack's installation in 1974 at the Cathedral. I also sang in a LAPD service in the mid-70's. I also sang at Frank Owen's retirement Evensong. The most magnificent liturgy was a Solemn High Mass for the American Church Union and the St. Alban's Choir singing. Check out this shot with a dossal curtain behind the high altar. I think this is how the cathedral looked before the mosaic and cross were installed in the early 1960s. I was in the choir school under Frank Ownen and Bill Crosby from 4th through 8th grade. we toured England for three weeks in 1967. We sang in St Pauls Cathedral in London, received medals from the Royal school of Church Music and met the arch Bishop of Cantabary. I still have the two original records we recorded as well as the original audio tapes if someone needs a copy.Great memerories and hello gordon, great voice. I was a choir boy in between 1969 - 1971 I was blessed to be selected to be one of the soloist for the Messiah. We sang Mozart’s requiem and we often got the chance to see Frank Owen at his beloved harpsichord. That was many years ago…but I can still close my eyes and hear myself singing at St Paul’s. I was in the last choir to attend school at the building prior to the school being sent to Campbell Hall. As promised, I have found the photo of the Rose Window and the Antiphonal Pipe stack of the Cathedral, which graced the cover of the first record (vinyl) made by the Cathedral Choir. Thanks, Don, but the link isn't working. I'm eager to see it. What a great website. I am trying to identify a handful of stained glass windows and some folks seem to think they are remnants of windows from St. Paul's. Do you have any additional information regarding this statement in your blog post: "the stained-glass windows were preserved." Thanks. I too, was a choirboy for a few years in the late 60's and 70's but i don't remember exactly when as were my cousin's(about 5 of them) and we sang every Sunday under the direction of Mr. Frank Owen and we practiced at 2-two locations. 1-One location was at Cortez Street Elementary (now known as Betty Plascencia School) on Wednesday's & the other location was on Sunday prior to each mass in the back room with Mr. Owen in our Red button-down robes & White tops !!! Thank You All, for bringing me back to my favorite times as a child...BTW, we were featured in an recorded album during that time !!! Hopefully this blog is still alive and kicking. I have been doing some research into a relative of mine, Arthur Letts, and it appears the pulpit at St Pauls LA was erected in his memory by his three children following his death. I had hoped that on my next visit to the USA I might have had a chance to view some things of note such as this so was gutted when I saw that the building was demolished. I wonder whether such things as the pulpit would have been saved. Perhaps someone can answer the question? As a high school student in the 60s, I probably walked pass St Paul's many times without taking notice. Then in Mar 68, my then-girlfriend, a soprano in our high school choir, needled me about attending their concert (in conjunction with another high school choir) of Faure's Requiem. She emphasised that, after all, it was my chance to see a Cathedral. Reluctantly I went, but found the prefatory organ music far more interesting. The concert was recorded and I got the LP record, but after several auditions still I was unimpressed by what she maintained was a great piece of music, and yet deeply impressed by the organ works preceding it. When I got home that evening, I saw on TV, Pres. Johnson announcing his retirement. Frankly I wasnt much impressed by the architecture of the Cathedral but since I didnt photograph it at the time, I wanted now to see how it appeared.